Our massive 15ft x 18ft Disco Dome Bouncy Castle comes complete with speaker system and disco lights that dance to the music. Easily connect to your Bluetooth enabled devices to play your favourite songs. 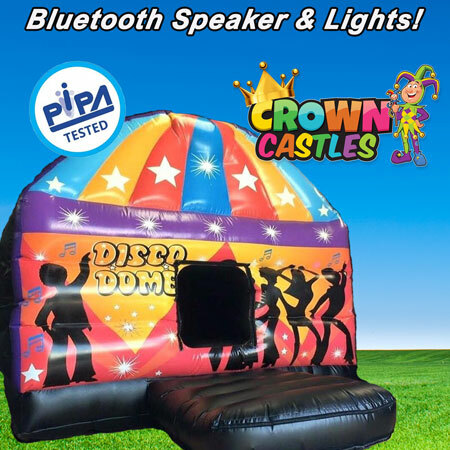 2 in 1 - Bouncy Castle and a Disco all rolled into one! This is all you need to get your party going with its deep bed and extra long step it is perfect for all ages to show off your unique dancing skills. During Hot Weather, This Inflatable Dome May Not Be Available As Temperatures Inside Can Get High. Free local delivery from us in Kimbolton, this includes Huntingdon and St Neots and parts of Bedford and Northamptonshire. Suitable for indoor or outdoor but please check that this large disco dome will safely fit being sure to check the height for indoor hires.